The only Voodoo Blue Porsche 918 Spyder ever made is heading to auction later this month. 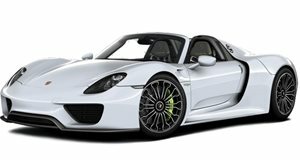 Being seen in a Porsche 918 Spyder is sure to attract attraction. With only 918 models produced, Porsche’s halo hybrid hypercar isn’t exactly a common sight. While the majority were painted in Porsche’s standard Mexico Blue, this one stands out even more thanks to its unique Voodoo Blue finish. As if it wasn’t already distinctive enough, following its delivery the 900-horsepower exotic was styled with a black, white and grey Martini livery harking back to some of Porsche’s legendary Le Mans race cars. The one of a kind has been on display at the Rock and Roll Car Museum in Texas since it left the factory two years ago, and now it’s looking for a new owner. Further distinguishing this unique 918 Spyder are stylish silver brake calipers in contrast to the Acid Green calipers fitted to most 918s that make it stand out even further. Even the ignition key is coated in the same Voodoo Blue color as the exterior, just to remind you that you own the only 918 like it in the world wherever you go. Our only gripe is that it hasn’t been fitted with Porsche’s Weissach Package, which would have made this striking 918 extra special. Like every 918, the Voodoo Blue model is powered by a rear-mounted 4.6-liter naturally-aspirated V8 engine mated to a pair of electric motors to produce a combined output of 887 hp. Porsche is in , so now is probably a good time to snap up a 918 Spyder. If you want this particular model though, be prepared to pay a premium when it goes under the hammer at upcoming Las Vegas auction on October 19. There’s no reserve price, but since this is a one-off car with less than 1,200 miles on the odometer, we wouldn’t be surprised if it becomes one of the most expensive Porsche 918s to ever cross the auction block.